Style N Season: Are You A Fashionista Mom? Are You A Fashionista Mom? A friend called me "Fashionista Mom". Though I think she used the word 'fashionista' too lightly, it was a nice compliment. I imagine fashionista as very high fashion, elegant, and expensive-looking. You know, glamorous. I'm more into having fun, cheerful, wear-what-I-like, wear-whatever-makes-me-happy, modest, feminine, and frugal fashion. Yet, I also cannot understand women who spends tons of money and time to make their five-year-old daughters into carefully-made-up Barbie dolls, makes meticulous scrapbooks, arts and crafts, while they themselves are dressed in sloppy clothes, oily face, unkempt, greasy hair. It seems a bit un-balance to me, to be spending so much effort on others, and so less on one self. Well, everybody is different, and is entitled to live their lives in the ways they see fit. Let's try not to be judgemental here, shall we. I basically wear ensemble that lift my mood, makes me happy, nice to look at, yet comfortable so once I dash out the door I can forget about what I'm wearing and concentrate instead on the tasks I need to do, the errands I need to run, the people I need to meet, today's Bible verses I want to read on my iPhone, where I am going to go for lunch, what groceries I need to buy, the menu for my child, dinner for Hubby and me, things for the home, cleaning, writing a blog post, what book to read before bed time, etc. When I put on make up and dress up in the morning, I prepare myself for the day not just in terms of look and physical manner, but the process also sort of spiritual preparation on the many roles that I will play that day: a wife, a mom, a friend, a sister, a daugher, an employee, a homemaker, a career woman, the list goes on. We women play a lot of roles in and outside of the home. Let's play them all wholeheartedly and look as fabulous as we know while doing it! fine linen and purple are her clothing." Btw, before I get down to the details of my mommyform, here is what I did in my spare time... Creating Lung2Comic about my baby boy that I posted on Instagram @stylenseason ... Enjoy! Mommy can wear cartoon T-shirt, too! This one is so cute and cheap, I couldn't resist buying it! Everybody said it's too childish, but I loved it, so I bought it. It has lasted me about four years and been worn many times. Definitely cheap and good buy! 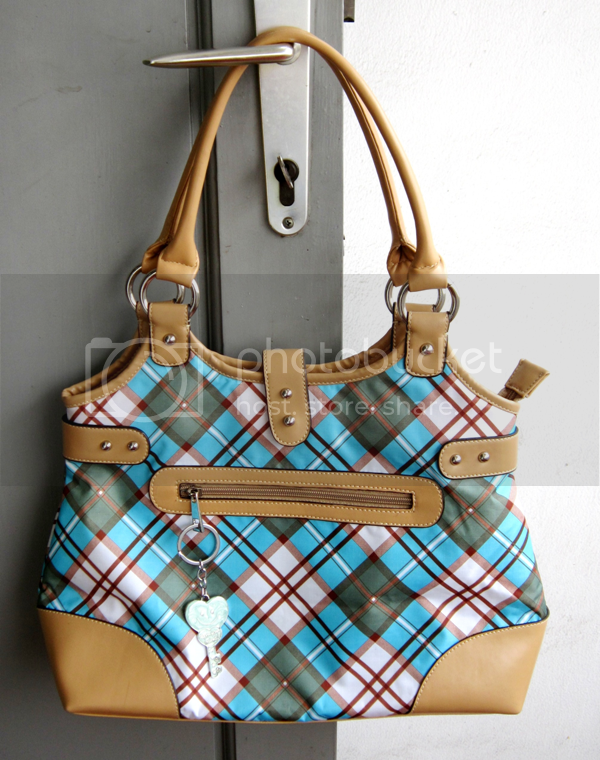 This cheerful plaid blue purse I got on sale three years ago, and I'm wearing it out! The material has started to peel off at some places, but I bet with some TLC I can still carry it for another year or even more, if I'm lucky. It adds a stylish note to even basic T-shirt and jeans combination, which I love. Layering with a light jacket is a good trick when you know it's summery and hot outside, but you will go to some cold indoors like the mall, or the frozen food section of the grocery store. This jeans-like, light jacket is a good investment which I got for about six bucks in an outlet. The fabric has a very nice sheen to it, rather like satin, but it also looks like casual jeans. When shopping, use your guts. My friend ruled it out, saying it's too shiny, but I got it and have no regret. What can glamorize a jeans and T-shirt combination? Shiny jeans-like jacket, that's what! I love your denim blouse and plaid purse! Thank you so much for linking up, and sharing Fashion Boutique Favorites! Glad you have a feel-good, no-fuss mom uniform that makes you feel good! Thanks for sharing your outfit with Manic Monday! Always a good idea to have a "uniform" especially as a busy mother. Thanks for joining Wardrobe Wednesday! I'm a firm believer in wearing what you like and that makes you happy! Glad you found us over at Manic Monday! Hope to see you back next week! I agree! I'm all about wearing cute quality clothes rather than looking frumpy! 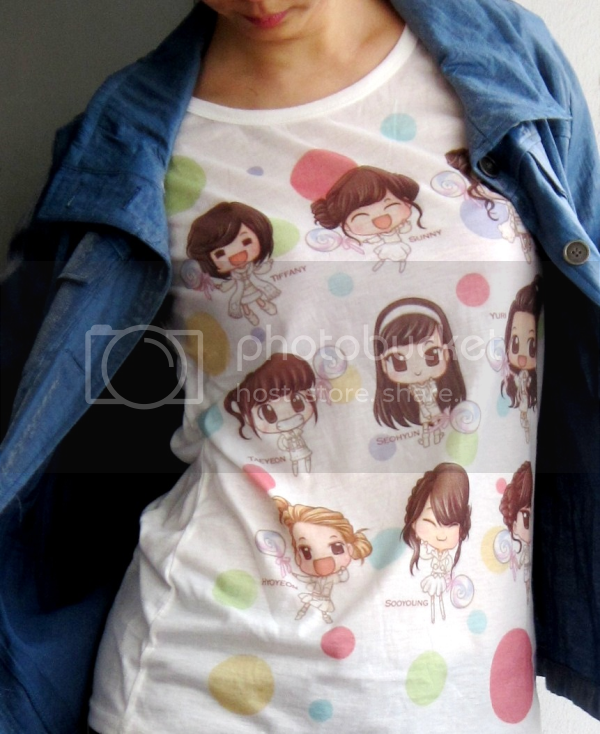 So cute...love the tee shirt! Thanks for sharing on the Thursday blog hop! I've been looking for a light weight denim jacket for a little while now, with no real luck. Adore yours. Such a cute graphic tee! Great look. Thanks for linking up with Tres Chic!! I too wear something "out' if it is a favorite item. I like the fact that you have your Bible verses in your phone to view during the day. Thank you for sharing your lovely photos and story with us here at "Tell Me a Story." You look really nice and totally fun. I love your gold sandals so much. Linking up from fashion Friday. I don't know which I like more the cartoon shirt or the comic of Lung. He is super cute! I haven't stopped by in a long while to visit. I saw your picture over at Missional Women's linkup. I love your jeans-like jacket and cartoon shirt. Your baby has grown so big and cute!! I do not own any pictures in the posts unless stated otherwise. Watermark theme. Powered by Blogger.